Please join us this First Friday, September 7, from 5-7 pm and celebrate new work from our featured artists, Susan Ellis and Susan Lindsey. We are delighted and proud to have our artist in residence, Susan Pennewell Ellis, as a First Friday featured guest artist! Susan is an Anchorage legend in the art scene. Her sense of color, space and nature is extraordinary. The inspiration for her landscapes is often found close to home - Kincaid, the coastal trail and local gardens are favorite subjects. Come early for first pick of her fresh, colorful paintings. We are also excited to feature new works by longtime Alaska oil painter Susan Lindsey. 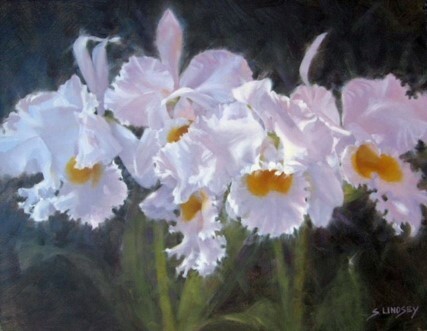 Susan is known for her beautiful still life paintings as well as her plein air landscapes and her figurative work. Born in Buffalo, New York, Susan began painting at age 12, and fell in love with the medium of oil paint the following year. In her paintings, she explores the grace of everyday objects, the patterns of light and shadow, and the play of color and edges. Susan's work has been exhibited in galleries in Alaska, Colorado, Washington and Rhode Island, included in numerous national juried exhibitions and can be found in private and corporate collections across the United States and abroad. Her painting "Shadow Dancer" recently won an honorable mention at the Oil Painters of America National Juried Exhibition. Our non-profit for the month of September is Storyworks Alaska. The mission of Storyworks Alaska is to support youth voices. Storyworks helps youth develop skills, resilience, and engagement as they share their voices and their stories. They believe in the importance of listening, the protective value of connection, and the power of stories to foster resilience. Their Story Workshops bring volunteer story coaches into high school English classrooms to encourage and support student storytellers. The stories that emerge offer opportunities for learning and connection between peers and community members. To learn more, visit their website at storyworksak.org.